(Nanowerk News) Researchers have found new methods to measure the internal pressure and surface tension of nano-sized drops of liquid like those involved in cloud formation and airborne pollutants to study how they behave in different environments. Understanding the function of these droplets in cloud formation is relevant to the study of climate change. Similarly, airborne pollutants can also come in the form of nanodroplets. Nanosized drops of liquid are also used in labs to act as nanoscale “reactors” — tiny containers to house chemical reactions at high concentration. In order to understand how nanodroplets behave in each of these contexts, a researcher must be able to measure properties such as internal pressure and surface tension. New research conducted by Feng Wang, U of A associate professor of physical chemistry, along with graduate student Kai-Yang Leong, has found methods to calculate these properties. The research, funded by the National Science Foundation, was published in the Journal of Chemical Physics ("A molecular dynamics investigation of the surface tension of water nanodroplets and a new technique for local pressure determination through density correlation"). Wang explained that, because nanoscale droplets are highly curved, their surface tension cannot be calculated in the same way as the surface tension of liquid with a flat surface. These tiny droplets are also difficult to study because they evaporate quickly. “A conclusive understanding regarding the surface tension of nanodroplets is far from being achieved,” the researchers said in their paper. In order to find the surface tension, researchers must know the internal pressure of the droplet. Established methods of calculating pressure in liquids use a measurement called virial pressure, which uses force and distance to calculate pressure. These methods work well for large amounts of liquid but not for small droplets, where minor changes in distance have a more pronounced effect. Wang and Leong used the U of A High Performance Computing Center to develop a new method of calculating the internal pressure of a nanodroplet. 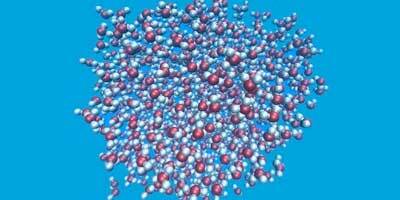 Using a type of computer modeling called molecular dynamics simulation, the researchers were able to calculate the internal pressure of nanodroplets by first establishing the relationship between the density and the pressure of the droplets. Since the density of the water could be established, the researchers could then use this as a proxy to calculate the pressure. “To the best of our knowledge, the use of a proxy to measure pressure has not been done in a simulation,” they said in the paper.